Diabetes in the United States is an epidemic, there are upwards of 30 million people with diabetes, among which upwards of 3 million people with type 1 diabetes. It’s a huge problem. People with type 1 diabetes don’t have a normal functioning pancreas to regulate blood sugar levels with insulin. Scientists are committed to developing an artificial pancreas for diabetes patients, thus diabetics could lead a more healthy and relaxed life. Aaron Kowalski, comes from the Juvenile Diabetes Research Foundation in the U.S., who is working to develop an artificial pancreas. Aaron Kowalski said: Ideally, what we’re trying to do is replicate what the pancreas does. Beta cells in the pancreas sense glucose levels, they sense the glucose levels changing and they secrete the right amount of insulin at the right time. 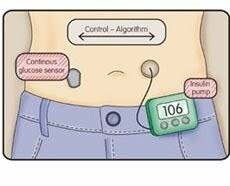 Kowalski said the artificial pancreas works with a cell-phone sized insulin pump – a small patch on the skin that continuously monitors glucose levels – and computer software that communicates glucose levels to the insulin pump. Obviously when a diabetic are sleeping, it’s very difficult to monitor his blood sugar concentration (if impossible). So we think maybe we could have a machine doing it, it could restore much better glucose control, reduce the risk for those complications. Most people don’t realize the burden of daily diabetes management. Managing diabetes can be just a 24-hour-a-day, 7-day-a-week grind that’s hard on people and their families. So this technology bode well for making people with diabetes healthier and making their lives easier.